1. 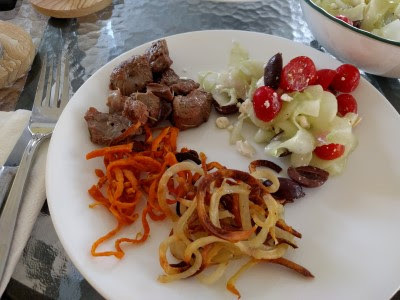 We had a lot of fun trying out our new spiralizer last weekend. In addition to spiralizing potatoes, we spiralized a cucumber. It made lovely, thin ribbons - I love thinly sliced cucumber. 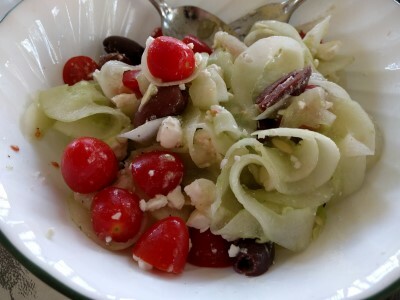 We made a salad of spiralized cucumber, kalamatas, feta, and tomatoes with lemon juice squeezed on top. 2. We were enjoying the nicer weather - grilling weather. 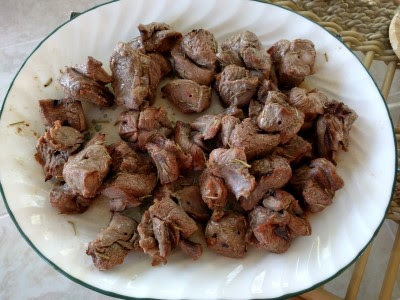 We grilled shrimp and marinated lamb kebabs. Both were delicious. 3. Grilling weather also means mowing & weeding weather. SP mowed on Saturday and by Monday our lawn was again filled with dandelions. 4. Game of Thrones is back! I read some sort of negative reviews of the premiere, but we both enjoyed it. 5. We are also very much enjoying The Night Manager on AMC. 6. I finished reading The Wife, the Maid, and the Mistress by Ariel Lawhon. I really enjoyed the book. It's based on real events in NYC in the 1930's, the disappearance of Judge Joe Crater. 7. SP has had bad allergies and finally tried a neti pot. I don't think it's helping much since he is driving me crazy with his snorts and sniffs and coughs and throat clears all night long while we watch TV. Then he snores all night when we go to bed. Last night was the worst. I was having insomnia and every time I started to finally fall asleep, his snore rumbles would wake me up, even through my ear plugs. 8. We have a very busy weekend of errands. I don't mind errands, but thanks to sickness and surgery and family obligations and such, things we want/need to do have piled up. Some of it is "investigative" and that's the kind of errand/shopping that drives me crazy. I like to walk in a store and find exactly what I need/want with minimal browsing, not visit several stores in search of something that in the end seems like we settled for but it still gets the job done so it's... fine. Just fine. 9. I don't think we'll be grilling this weekend. Tonight's fun discussion will be the "what do you want to cook this weekend" discussion. I hope someone has some ideas!